Page revised in August 2013. In the XIIIth century the town of Urbino came into the possession of the da Montefeltro family and in the second half of the XVth century when it was ruled by Federico da Montefeltro it attained great prosperity. The monuments of the town built by the da Montefeltro and after them by the della Rovere are covered in other pages, which you may wish to see first. In 1626 Pope Urban VIII convinced Francesco Maria II, the last and childless Duke of Urbino to return his small state to the direct government of the Pope. This occurred in 1631 at the Duke's death. 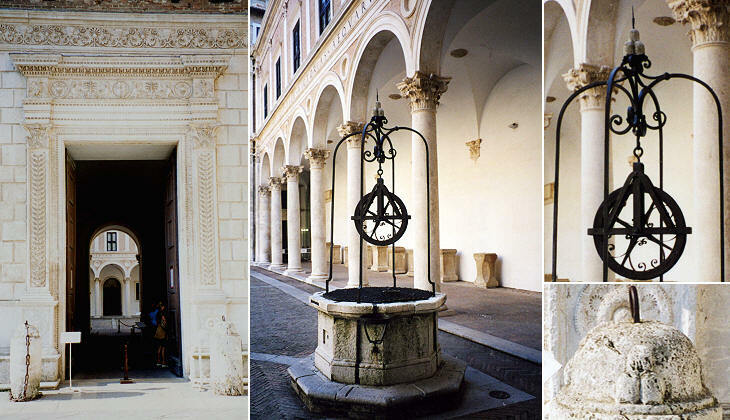 Urbino rapidly lost importance and entered a period of decadence. The popes focused their attention on Rome and little money was spent elsewhere, unless the Pope had a special reason for doing so. In November 1700, Cardinal Giovan Francesco Albani, who was born at Urbino from a family of Albanian descent, was elected Pope and called himself Pope Clement XI. For Urbino the election was like winning a lottery as the Pope and his family tried to reverse the decline of the town. 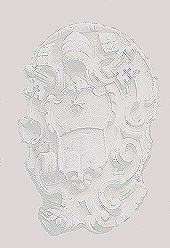 Gian Francesco Albani had been appointed cardinal by Pope Alexander VIII and as a sign of gratitude he put the coat of arms of this pope over the entrance of his palace. 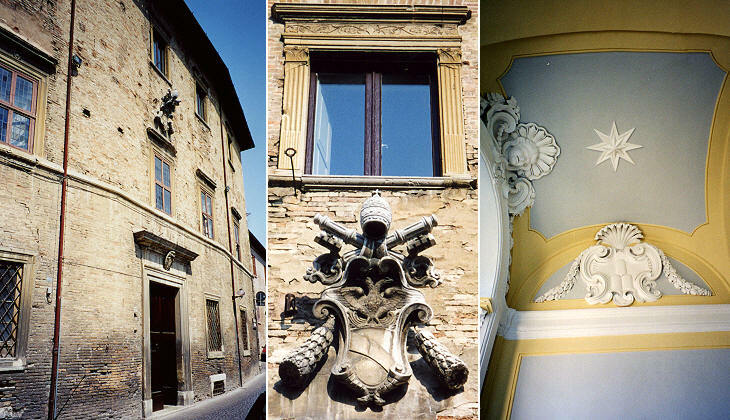 The building was redesigned in the early XVIIIth century and its interior is decorated with the Albani's heraldic symbols: three mountains topped by a star. He restored Palazzo Ducale, without emphasizing what he had done, but just putting his mark on little details (the little pillars at the entrance and the top of the well in the courtyard). Urbino, or to be more precise Castel Durante (renamed Urbania after Pope Urban VIII), had a tradition for high quality majolicas. 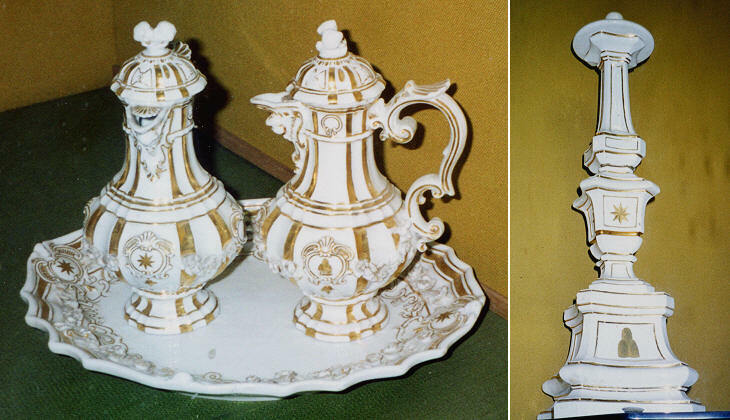 This, coupled with the XVIIIth century passion for coffee and cocoa, explains why the Museum of the Cathedral houses this set decorated with the Albani heraldic symbols. 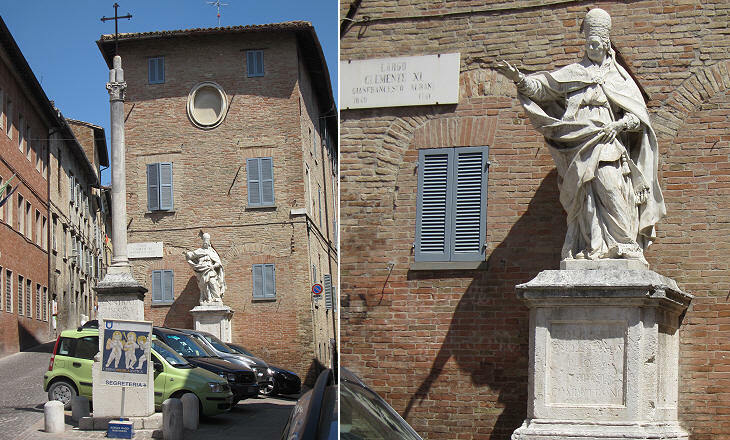 The influence of the Albani in Urbino lasted beyond the death of Pope Clement XI in 1721. 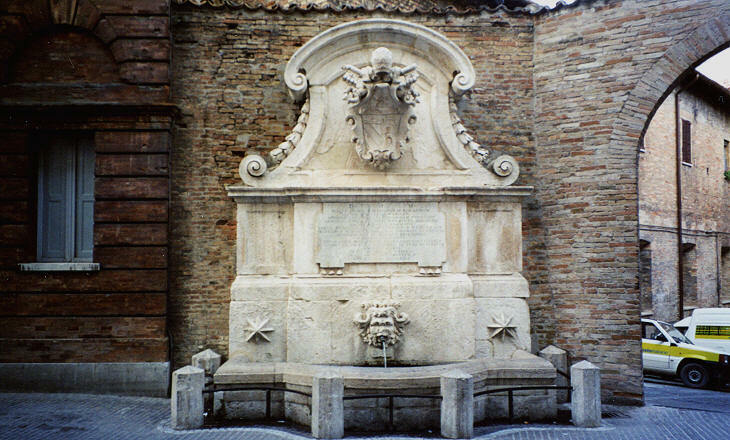 This fountain opposite their family palace bears the coat of arms of Pope Benedict XIII, who was elected in 1723, but the stars are a reference to the Albani who promoted its construction. Pope Clement XI ensured the wealth of his family by assigning his brother a fiefdom (Soriano al Cimino) and by appointing two of his nephews cardinals. Cardinal Annibale Albani, the elder of the two, held several important positions in the Curia until his death in 1751. In 1737 he decided to embellish Urbino by donating the town a statue of Pope Alexander VIII which was placed near the family palace. Alessandro, the other Albani cardinal, is best known for the collection of ancient statues he gathered in his Roman villa. 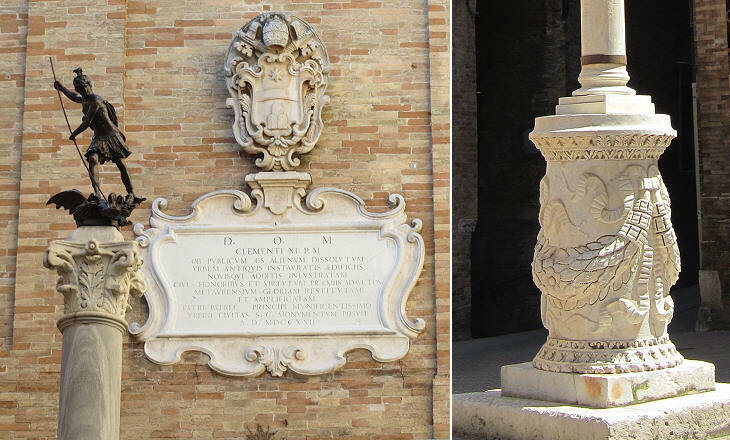 In 1798, when Urbino was occupied by the French, the inscription was modified and the statue became the portrait of Pope Celestine V, the shy monk whom Pope Boniface VIII forced to abdicate. 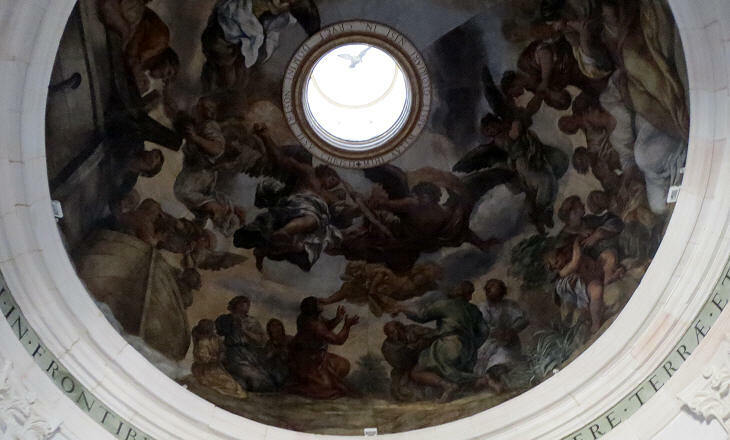 In 1668 Pietro da Cortona, one of the greatest painters of his time, was commissioned a series of canvasses which would serve as a model for the mosaic decoration of one of the smaller domes of S. Pietro in Rome. Da Cortona died in the following year and the work was completed by Ciro Ferri, his chief pupil. Eventually the paintings were not utilized and lay abandoned in a warehouse. 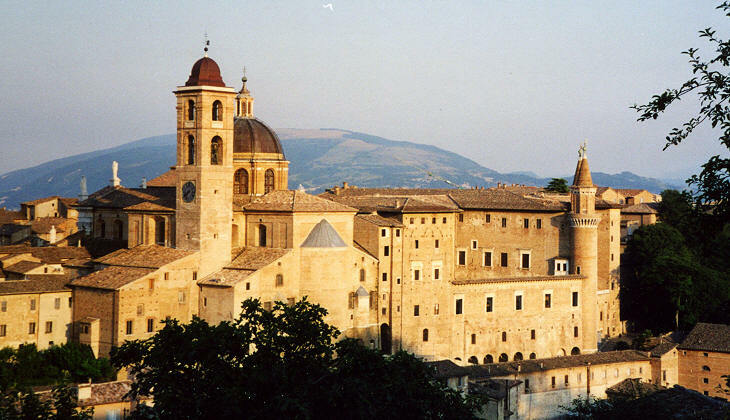 Cardinal Annibale Albani ordered their move to Urbino where they were adjusted to fit the dome of a chapel in a nunnery where Duke Francesco Maria I della Rovere and his wife Eleonora Gonzaga are buried. 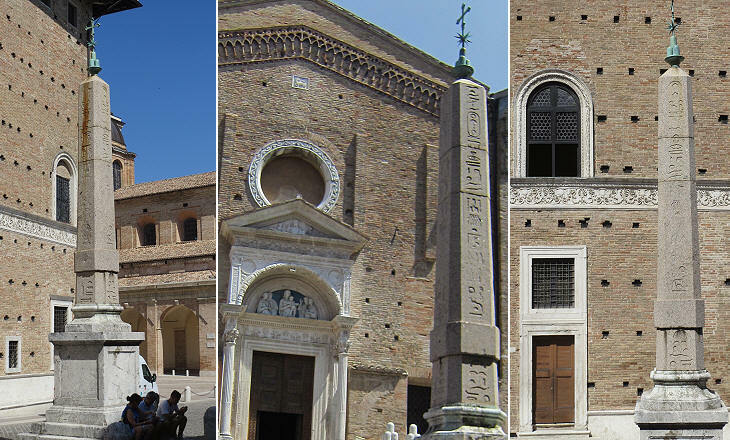 According to tradition in the XIth century the Bishop of Urbino, wary that his diocese did not have any relics of saints, asked his colleague of Citt� di Castello in Umbria to give him one of the bodies of the many saints he had in his Cathedral. He was given the body of St. Crescentinus, an early IVth century martyr who killed a dragon in the countryside of the town. The body alone, because the head was retained at Citt� di Castello. St. Crescentinus became the patron saint of Urbino and when Pope Clement XI commissioned a new series of statues of saints for Piazza S. Pietro he included St. Crescentinus in the list. Cardinal Annibale Albani donated a small bronze statue of the saint which was supported by an ancient column and by an altar which was found during the renovation of SS. Apostoli in Rome, which the Albani had promoted. Pope Clement XI erected in Piazza della Rotonda an obelisk from the Temple to Isis; his nephew Cardinal Annibale transferred to Urbino another obelisk (Egyptian - VIth century BC - broken into four pieces) from that temple. It is definitely the gift of greatest value he made to his hometown (to see all the obelisks of Rome click here).